This year in 2017, Suna Besa of Lord Jagannath takes place on 4th July (Tuesday). 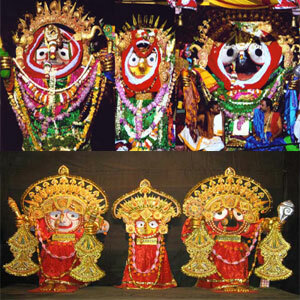 You can watch Sunabesa Jagannath live here from OTV, ETV Oriya, DD 6, Parthana, MBC TV here. The Suna Bhesa or Bada Tadau bhesa or Raja bhesa happens the day after the return of the Lords from Gundicha. Suna besha means Lord will dress-up with golden ornaments,weapons even not only that, all the devotees can see lord Jagannath’s incomplete hand and legs with completed golden arms, palms and feet. It is a glorious history lies behind this Suna Vesha. To watch Suna Besa Live Telecast Puri 2017 or Suna Besa Live Streaming Online on OTV, Click here. The name of the ornaments as per Local Language as follows. Kiriti, Odiani, Kana, Surya, Chandra, Ghagada mali, Kadamba Mali, Tadagi and Sevati mali. Sri Payar ( Foot ), Sri Bhuja, li Kiriti, Odiani, Chandra Surya, Kana, Adakari, Ghagada Mali, Kadamba Mali, Tilak, Chandrika, Alaka, Jhobakanthi, Chandra Surya, Swarna Chakra, Ropya Sankha, Harida, Kadamba Mali ( bids ), Sevati Mali. so great god at the world………………….